I’m not a huge fan of “light” recipes – those that use reduced fat, sugar-free, or otherwise chemically dimmed ingredients to simulate a luscious dish. “Light” mac and cheese should not exist. “Reduced fat” nachos? Why? A cake made entirely of Splenda? Shoot me. And have you ever tried non-fat cheese? It’s not quite as good as tasting your toothbrush after you accidentally get soap on it. I believe that if you want to eat “light” – and many times, I do – you should stick to foods that are naturally healthy – vegetables, fruits, whole grains, etc. But if you want to eat pizza, eat pizza, not a cardboard imitation. However, I recently purchased (yet another) cookbook, Cooking Light Comfort Food. I like Cooking Light Magazine- rather than using chemical substitutes, they (usually) opt for using less of certain ingredients -butter, sugar, bacon- or making creative substitutions, like honey instead of sugar, fresh fruit instead of jelly, pork tenderloin instead of ground pork. 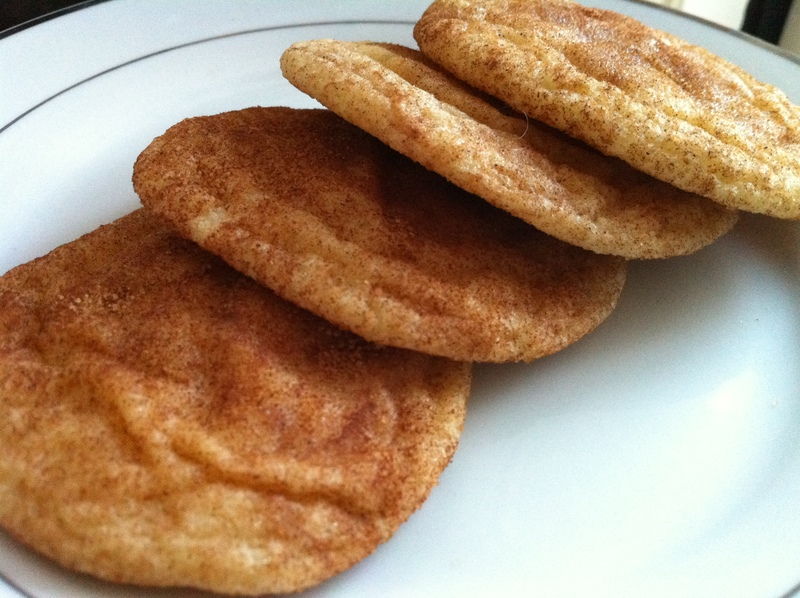 The cookbook is the same, and tonight I made their Snickerdoodles, my favorite of all cookies. The recipe uses only 4 tbsp of butter and 1 cup of sugar, adding a tbsp of light corn syrup to help with flavoring. The dough was delicious, and the finished cookies were moist and sweet – some of the best I’ve ever made. I was really patting myself on the back until I realized that the dough was supposed to yield 42 cookies. I made 16. It seems I’ve uncovered another trick of Cooking Light- make the portion sizes tiny. My 16 cookies were by no means huge – 8 of them fit in a single layer on a dinner plate. I guess I could have halved them and gotten 32 very small cookies, but 42 cookies from that dough would have been miniscule. Oh well, they were still delicious, and even though the size of my cookies meant they had about 115 calories instead of 50, and about 3 grams of fat instead of 1, they were still technically “light” and actually delicious. Voila. Stop! Those Snickerdoodles look awfully good but I still prefer the Carrot Cupcakes . Would you be interested in a Cooking Light Supper Club? The Boston Food Swap was born of CLSC members and we’re always looking for more people. E-mail me at bostonfoodswap@gmail.com if you’re interested.